It's time for another incredible giveaway. 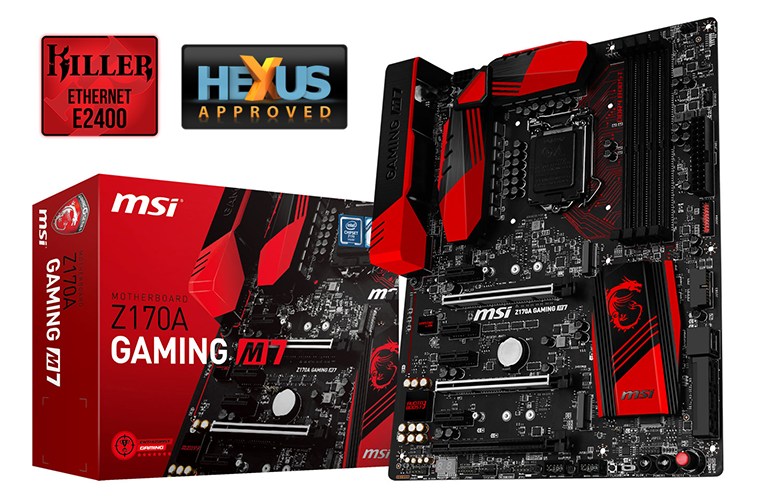 In partnership with Killer and MSI, HEXUS is giving all our readers the chance to win one of 10 Z170A Gaming M7 motherboards! Supporting the latest sixth-generation Intel processors and armed with a Killer E2400 high-performance Gigabit Ethernet Controller, the Z170A Gaming M7 is optimised for a superior online gaming experience. The board is worth over £180 at retail and we have 10 just waiting to be won! The HEXUS award-winning Killer E2400's intelligent prioritisation of network traffic results "in an improved network experience" that can "make a genuine difference to our everyday computing experience." You can read more about the technology in our in-depth review and be sure to follow Killer on Facebook to stay updated with all the company's latest developments. Want to see the E2400 in action? Check out the video overview embedded below. An awesome opportunity to bag some cutting-edge gear, so what are you waiting for? Answer the following question to enter this fantastic competition, and don't forget, you can also claim a free second entry via Facebook to increase your chances! The competition winner will be picked at random from all eligible entries that arrive by 22:00 GMT on the closing date, September 22, 2016. The winners will be notified via email by September 29, 2016. The winner must claim their prize within 7 days of the promoter sending notification. If the prize is unclaimed after this time, HEXUS reserves the right to offer the unclaimed prize to a substitute winner selected in accordance with these rules. The prize is one of 10 MSI Z170A Gaming M7 motherboards. A safe bet at £150? We find out. Adding the $3k Intel Xeon W-3175X, and hexa-channel RAM could easily push costs >$5k. Thanks for another great competition! Woot Woot! If I win one, I might as well get a new CPU and DDR4. Good luck to all! Awesome giveaway - If I win, that means I HAVE to upgrade the rest of my rig, right?